~ January 25, 2009- new best team time 16.703. ~December 7, 2008- new best team time 16.757- with room to spare. Curve 4.299, Hatter 4.171, Skye 4.189, Dash 4.094. ~August 16, 2008- Lucy Achieved the top pointed Standard Poodle in all of North America. 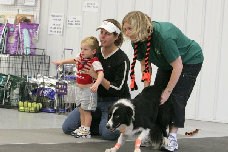 ~June 29, 2008- Hannah achieved the top pointed Australian Shepherd in all of North America. ~May 16, 2008- Omaha SpeedRacers team Rage- Consisting of Scooby, Hatter, Skye and Rage accomplished our new best team time of 17.599. 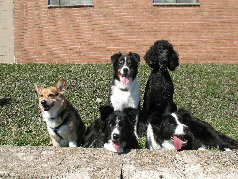 ~April 5 2008- Yoda achieved the top pointed Welsh Corgi (Pembroke) in all of North America.